Does Harry Potter Die In Book Seven? 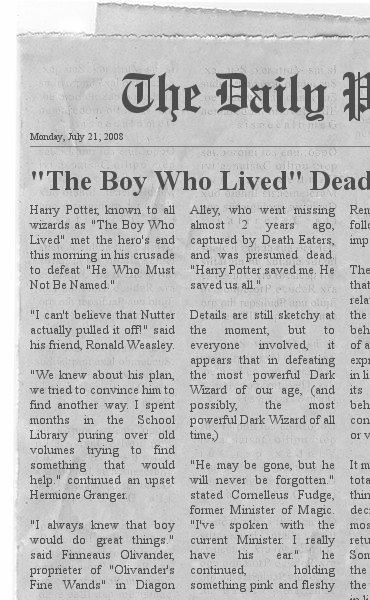 My wife is convinced that Harry Potter will die on his birthday, so I took that idea and ran with it. I don’t have any reference material with me right now, (the books are at home,) and I’m too lazy to go searching on teh intarwebs, so some of the names are probably misspelled and/or flat out wrong. I couldn’t remember the name of the “current” minister of magic, so I wrote around that with a lame joke about Fudge. Let me just say I have no inside knowledge about book seven. I am not connected in any way to J.K. Rowling. I have no idea what is going to happen. I’m just some goofy fan of the books. The clipping you see above is really just me rambling. It’s barely edited, and incomplete. If I get ambitious, I might try re-writing it and making a complete article. I have a couple of other funny (to me) ideas that didn’t fit into the space allowed in the clipping. Ok – so I suspect that I’m going to get more than a few hits to this post. Welcome one and all. Feel free to post a comment. (Let’s put that spam filter through its paces.) What do you think is going to happen in Harry Potter and the Deathly Hallows? Posted on May 11, 2007 Categories Books, Harry Potter, Humor, Movies, On The Net, Writing7 Comments on Does Harry Potter Die In Book Seven? I have really gotten out of the habit of writing here. To tell you the truth, I’ve barely even visited the site in the last few months. If you look hard enough, you might spot a couple of comments here and there, but my participation has been scant, at best. I’m working on a short series of entries that I plan to begin posting within the next week. I’m doing something a little different in writing them off-line because I want to take the time to make sure that I am communicating what it is I want to express clearly. A large part of what I have to say is going to be very difficult for me to write, let alone share. My writing style has never been very structured, which is fine for a majority of what post here, but the entries I’m working on right now are too important for me to not take the time to craft them more carefully than I normally do. There will be at least three installments. A majority of what I currently have planned as the second installment is already written. That piece was the catalyst for the project I’m outlining here. It needs to be cleaned up a bit, and I need to provide some context for it to really make sense. I started working on what will be the first installment tonight, which is really little more than an introduction. (I just laughed when I typed “introduction” – you’ll understand why after I’ve posted the first installment.) The third installment exists only as a nebulous cloud of ideas floating around in my head, and It’s going to be the hardest part to write. I know that because I’ve tried writing it before, and have yet to be able to do so with any semblance of coherence or clarity. I suppose you can consider this “installment 0”, or a foreword, or something. It is little more than a rough outline of what I plan to do. It is also a way for me to commit to finishing what I’ve started. By telling the world, (or rather – the small part of it that will read any of this – ) a little bit about what I have planned, I am much more likely to complete it. I made a promise to myself that I would finish this project, and I made a promise to someone else that I would share it. This post is the first step to keeping both of those promises.